It was all about treating moms last weekend. We did not plan anything except we had Saturday dinner with my side of the family and my mom. I was hoping for a surprise from J or the kids, but didn't turn out as expected, hahaha... just Sunday family lunch with them and my in-laws. Well, May is still considered mom's month, so if you still have not given your mom any gift last Mother's day, you an still have a chance. Here is one great idea that I know my mom (and myself) can appreciate - getting a beautiful new set of Corelle dinnerware. I've mentioned in my earlier Corelle feature that I grew up with Corelle. I love how well-made their products are. Their dinnerware is made of vitrelle glass - lightweight yet resistant to breaking, chipping and cracking. Corelle's non-porous surface also resists bacteria, stains and odors. No worries about icky smells stuck on the plates, no food stains, or toxic contamination - making it safe and healthy. Speaking of moms and Corelle, I remember when I was younger, I dropped a plate and it fell flat on the floor. My heart stopped and was scared it will shatter. Nothing happened! No crack, no chip. I was so relieved 'coz I know I'll upset my mother if our set will be missing a plate. Corelle has so many new collections now that's just perfect for modern women and young homemakers. I am eyeing a few new designs myself. They're thin, stackable, oven and microwave safe, and dishwasher safe. Designs can be matchy-matchy too with the Corningware cookware lines. We like having the same or complimenting patterns on our Corelle and Corningware casseroles that can be used from kitchen to table. Both pretty and convenient to use. 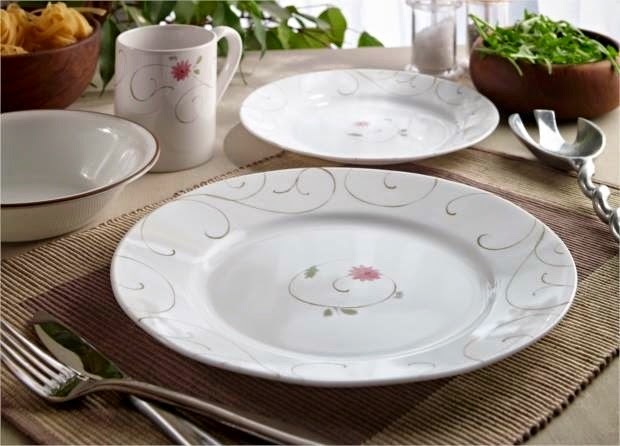 Own stylish limited edition Corelle sets for as low as P2,450! Surprise your mothers with a set or two of their lovely dinnerware, or use it to bring her breakfast in bed with her brand new plates! Hurry!!! Avail of this special offer which runs from today until May 18, 2014 only! Note: Top photo from World Kitchen AP Facebook page. Are you a mom with a flair for healthy and stylish cooking and dining? Join the Women of Health and Style Club now! Members can enjoy discounts and perks from Corelle, Corningware, Pyrex, Visions and Snapware. Just send your photo via social media using one of our brands with the hashtag #ilovecorelle, #ilovecorningware, #ilovepyrex, #ilovevisions or #ilovesnapware.